Spend a Saturday morning creating this no-shortcuts bezel setting for an ornate renaissance ring! Choose a semi-precious 8mm stone such as Labradorite or moonstone, place it on sterling silver sheet, and wrap it in a mounting of silver bezel wire. 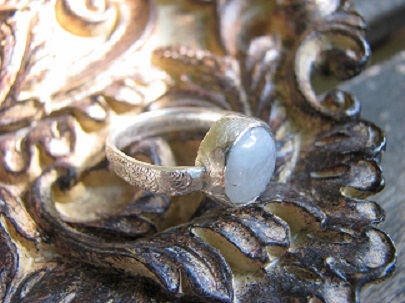 Solder the silver joints, then form and finish your patterned wire ring shank. The breathtaking finish is created by pressing the bezel around your stone. Learn advanced techniques - setting a bezel, soldering, and sizing. Materials included. Ages 18 and up. Previous solder experience necessary.